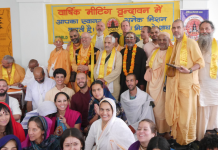 The Vyasa puja of Srila Prabhupada was conducted with joy and with the participation of countless sannyasis. 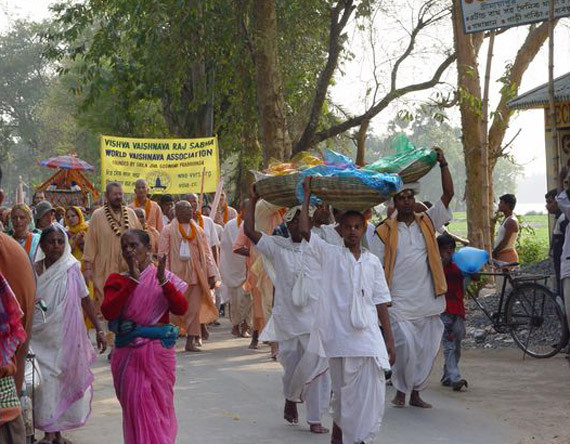 Starting from Mayapur ghat the devotees took the murti of Srila Prabhupada, which is worshipped in the Gopinath Gaudiya Math, and a big beautiful painting of Srila Prabhupada on parade. 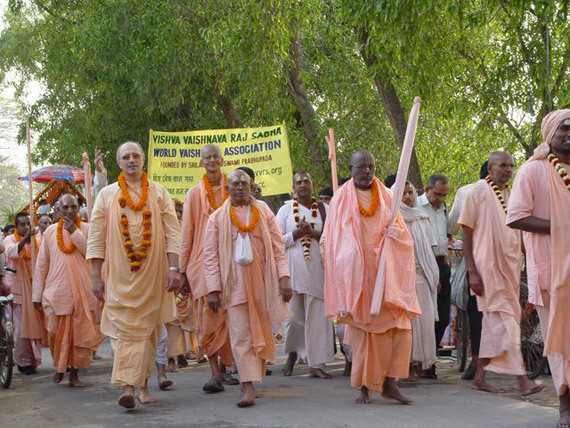 The parade went along all the temples where Srila Prabhupada was awaited with many offerings. More and more devotees joined together as we got closer to the main temple (Vraja pattan), where Srila Prabhupadas samadhi is located. 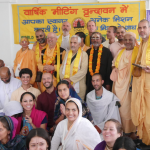 The banner of the Visva Vaishnava Raj Sabha reminded us of the united effort and diversity of the participating missions. There are still some missions who did not participate. 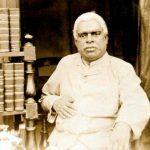 We pray that with time they will see the beauty of the effort made by the Saraswat family and the valuable ideas of the Vishva Vaishnava Raj Sabha. 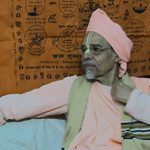 To glorify Srila Prabhupada is one thing, but to actually cooperate and share the accomplishments of our respective preaching for the benefit of all is still a stage to be achieved. But one thing is clearly noticeable. 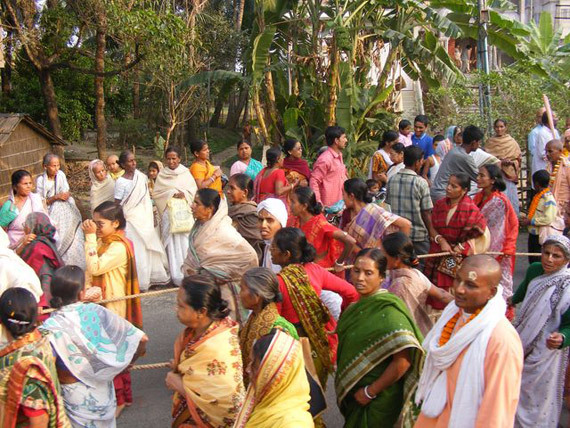 There are plenty of people in the new and old gaudiya missions who would do anything to please Srila Prabhupada. Many would even die for him just because they were touched by his love. 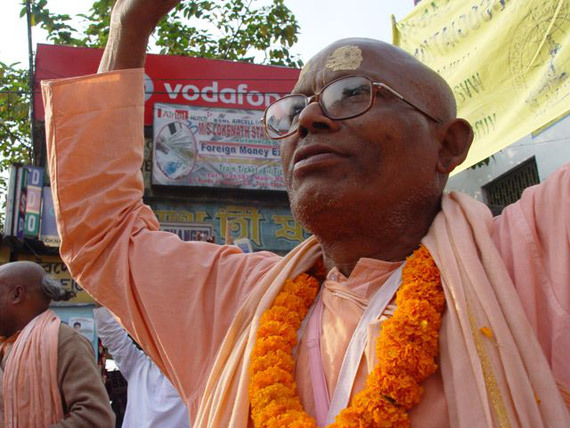 Srila Prabhupadas love touches people again and again. Generation after generation. Who loves a scientist or a rich man? The love we get from sri guru is beyond comparison. And Srila Prabhupadas associates, his disciples who continue his mission also transmit that love. Just see how the missions are spreading. 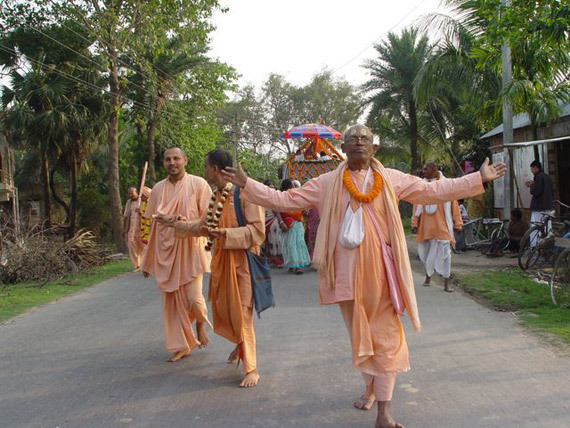 Mahaprabhu definitely has his own plans on how to reach out to the world. Nobody can understand it, because it's magical. All we know is that he got us, he transformed our heart. He reaches people which we considered unreachable. He penetrates illusion with his love. So we come together to recognise that fact. 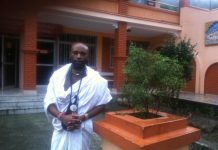 To meet with amazement when you see that the same love of Srila Prabhupada has already reached out to people in China, and other far and difficult places. 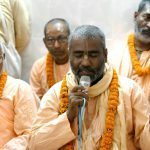 Yes, Srila Prabhupada was unique. Because he served with perfection the spirit of our devotional school. The gift of the plurality of sanatan dharma. 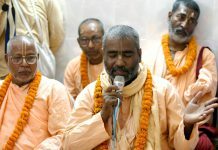 The all including plan for mercy-distribution which motivated him again and again to send his devotees to the west. And today devotees of the west are part of his mission and bring new ways into the sampradaya to spread the teachings in unexpected ways. Forceful speaches enlivened the audience and showed how much energy is there to spread the divine teachings of our master. 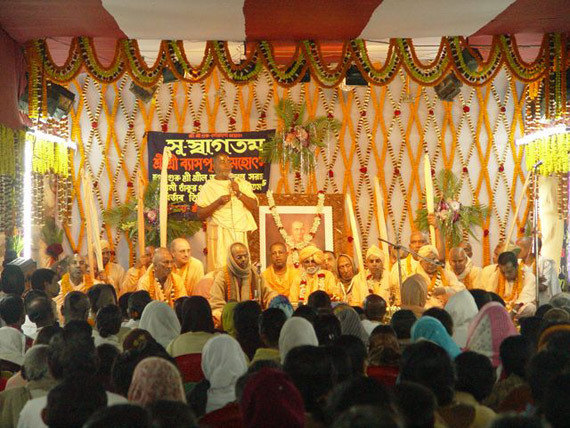 Sripad Bhakti Vichar Bharati Maharaja, a disciple of Srila Bhakti Kumud Santo Maharaja, gave his love with a real pushy style to wake up and preach his glories which the audience applauded with enthusiasm. 50 sannyasis were sitting on the stage taking turns to glorify our saviour, our loving spiritual grandfather. The new generation of preachers are gradually taking over responsabilities. And we will see so many new aspects of Srila Prabhupada's mission unfold over the years. Sripad Bhakti Prapanna Tirtha Maharaja spoke about love in cooperation. 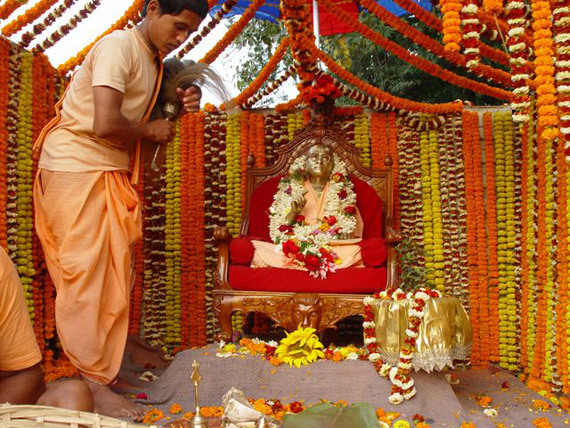 In the samadhi of Srila Prabhupada was a sweet meeting where Srila Bhaktivedanta Paryatok Maharaja made an offering. 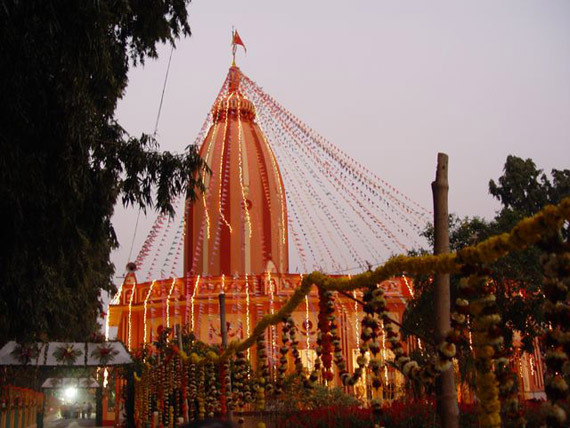 The rest of the festival took place in a pandal erected in Sri Chaitanya Gaudiya Math. It is possible to cooperate for a nice festival and it is also possible to help each other on all common fronts 🙂 That will please Srila Prabhupada very much.